How does this make you feel? I went to Babies R Us tonight after work to check out some giraffe stuff I had seen online and snoop around a bit. As I was pulling into the too-good-to-be-true parking space, I discovered it was. As I put my car into reverse, I wanted to be mad. 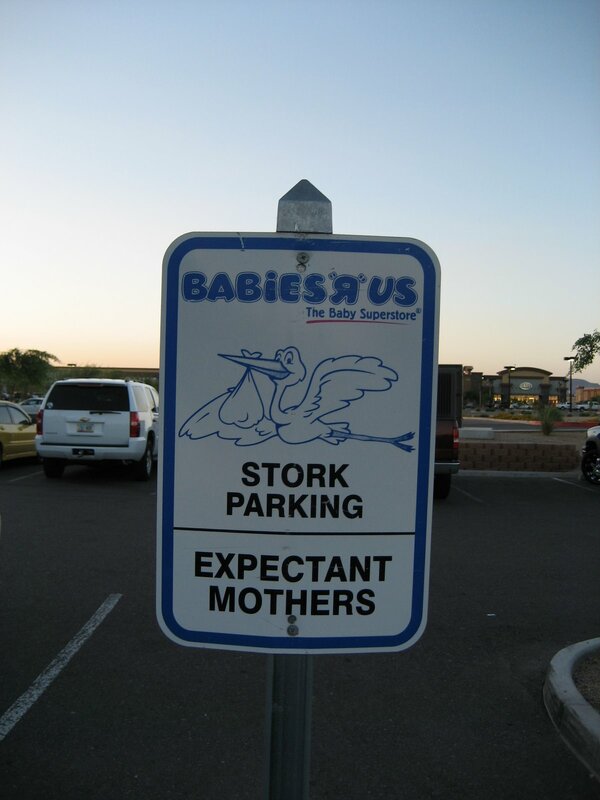 Then, I decided that I WAS an expectant mother, so I was going to park there anyway (car back into “DRIVE”). Then I literally laughed outloud thinking of trying to contest a ticket in court (car back into “REVERSE”). So I parked somewhere else. I still don’t know how it makes me feel. I agree you are an expectant mother…telling people I am adopting I tell them this is part of my 9 month wait and I am 3 months into it….you should of parked there…I would! you totally should have parked there – you are an expectant mother – you just don’t know how long your “pregnancy” will last. I remember shopping for baby items while we were waiting…the store clerks always assumed we were shopping for gifts! We used it as an opportunity to educate! I can totally relate to your thoughts. As long as there is no baby and no big belly most people don’t give you the courtesy of being expectant. I have seen those too, at BRU and at a local grocery store. I think once I am paper pregnant, I will be parking there…at least once in a while. Sometimes I feel as though you are writing my thoughts! Wow…I have SO been here!! Actually I had a similar experience around mother’s day this year. I was at dinner with my best friend and her two young daughters. At checkout they were giving all “mothers” a $10 gift certificate. Well…since I was holding my friend’s baby at the time, they mistook me for a mother and gave me a gift certificate. I felt bad about it at the time, but it was an awkward situation at best. I went back and forth about this for a while, and then finally, I decided to WAS entitled to use the gift certificate. I AM a mother, right? Maybe not to a human baby (YET,) but certainly to my dogs…and certainly to all my little garden babies. So…whatever…I used the gift certificate and I now feel OK about that decision. I am OFTEN mistaken for a mother because I’ve always got little friends in tow. This never ceases to be painful, but it’s just society’s view, and yet another link in the chain of the pain associated with infertility. What can we do?? !